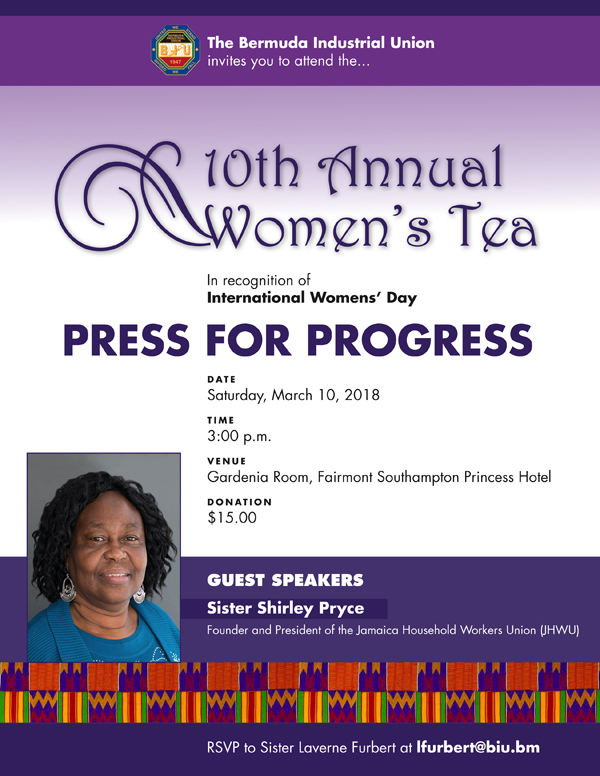 The Bermuda Industrial Union will be hosting their 10th annual International Women’s Day Tea on Saturday [March 10] at 3.00pm in the Gardenia Room at the Fairmont Southampton Hotel. A spokesperson said, “The Guest speaker for this year’s event will be Sister Shirley Pryce, a former domestic worker from Jamaica. Sister Pryce is the President and Founder of the Jamaica Household Workers’ Union and she now chairs the Caribbean Domestic Workers’ Network and was one of two Caribbean representatives who participated in the International Labour Conference to develop and adopt the landmark Domestic Workers Convention in 2011. “The ILO Convention 189, which has been adopted by Jamaica, lays out international human rights standards towards improving the working conditions of an estimated 67.1 million domestic workers worldwide. “Recently Sister Pryce spoke with UN Women at ‘Voices on Gender Equality from CSW: Civil Society meets the Press’ event, on 16 March, as part of the 61st session of the Commission on the Status of Women. Her work contributes towards Sustainable Development Goal 8, which calls for productive employment and decent work for all, and protects labour rights for all workers. “The BIU’s first International Women’s Day Tea was held in 2008. The guest speaker for our tea in 2009 was Mrs. Wanda Henton-Brown, wife of former Premier, Dr. Ewart Brown. Other speakers include Former Premiers Paula Cox and Dame Jennifer Smith, MPs Kim Wilson and Neletha Butterfield, former Assistant Secretary to the Cabinet, Judith Hall Bean, Rev. Judith Gardiner, former Senator Kim Wilkerson. “Last year, the BIU invited two students, Tae-Eja Bean and Latifa Smith to speak at the annual event. However, Sister Latifa was involved in an accident and Sister Raykaya Simmons filled in for her. Opinion: Why Do I Oppose The Policy Change?